While Mike Green wanted to hide his head, Alex Ovechkin had plenty of reason to shout . 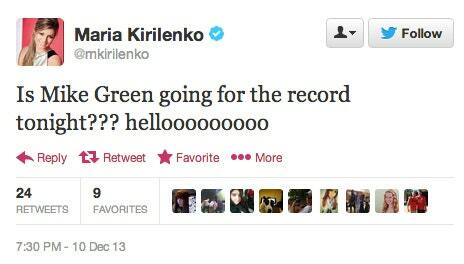 . . and apparently Maria Kirilenko did, too. When Mike Green turned in one of the worst 10 minutes in the NHL this season Tuesday night, Alex Ovechkin bailed out his teammate with four goals in a dramatic 6-5 shootout win. If only Ovie’s finacee were so forgiving. Already struggling through much of this season, Green, a two-time first-team All-Star, played about as bad as a player could against the visting Tampa Bay Lightning, committing five penalties, racking up 18 penalty minutes, giving the Lightning two power plays (they scored on both) and getting beat as the lone man back on this 2-on-1 rush. He finished the period with less than four minutes of ice time and a minus-1 rating, and contributed mightily to starting Capitals goalie Braden Holtby getting pulled after 11 minutes and three goals allowed on eight shots. He was booed mightily by the home crowd through the end of the game, and ripped apart on Twitter. 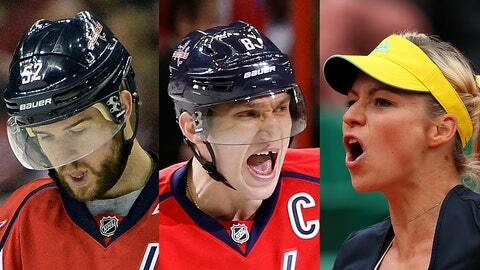 And after Ovie’s heroics, Kirlienko ended her night in a much better mood. And the biggest kicker of all? Assisting on Ovechkin’s second-period goal that gave him a hat trick? Mike Green needs to send Richard Panik a thank-you card for taking a dumber penalty than he did.